Watching native wildlife is a treat! Springtime is the best time to watch for nest building and the arrival of young. It is likely that you will encounter a baby animal in your yard at some point. Backyard wildlife needs very little from us — remember to give them the peace and quiet they need to successfully raise their young. The most important thing to remember is that wild parents know what’s best for their young. Many of them leave their babies alone as they venture off to find nourishment. Parents hanging out around the location of their young only attract predators to its location, but don’t worry, they are usually not far away and keep a watchful eye. We don’t need to get involved! Young animals don’t have a scent. If the parents have hidden them in the grass or elsewhere, predators will not be attracted to them. Keep a safe distance so you don’t attract predators and so you don’t scare the mother away. Wildlife parents are very devoted to raising their young, and it is unlikely for them to abandon them. Place caps on chimneys so animals don’t build nests inside. Check brush piles and tall grass for nests before cutting and/or weed whacking. Watch pets while outside for digging or interest in possible nesting areas. If you find an uninjured baby animal, leave it where you found it until you are sure the parents are not returning. You find a healthy-looking baby animal alone. It is best to leave it alone and not touch it, but if you are concerned, call for more information. Do not pick it up or bring it inside until you have called. 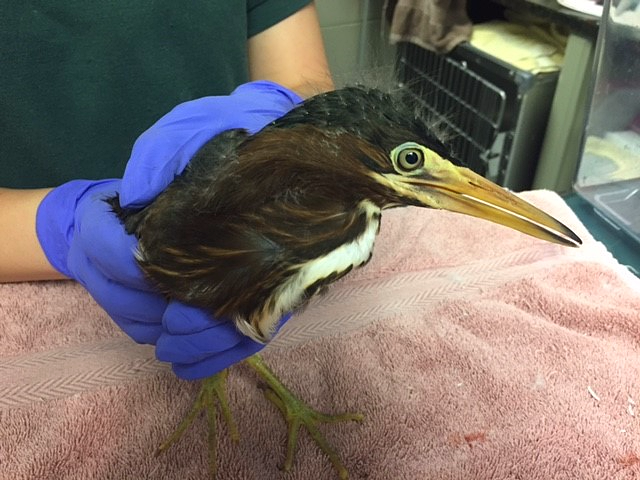 You find a baby animal in a “dangerous location.” A wildlife center can guide you on if/where you could move it or how to provide a makeshift nest to put it in a safe location. Your pet has found a nest of baby animals. Center staff can help you keep them with the mother and prevent your pet from injuring them. If you find a baby animal and any of these apply, call the wildlife center or bring the animal in right away. If you find an injured or cold baby animal, keep it warm but do not feed it. You can visibly see the animal has a broken bone, is bleeding or has an open wound. There are fly eggs anywhere on its body (eggs look like small grains of rice) or live maggots. If the baby has been in one spot alone for more than 24 hours, or it is crying and hasn’t moved from an area. If the baby appears weak, cold or lying on its side. If your pet attacked it. Wild animals can carry parasites and disease (even young animals). Some of these can be harmful to humans and/or pets. Some species of wildlife defend themselves by biting or scratching, even at a young age. While our first instinct is to feed a baby animal, the best thing you can do is keep it warm and not feed it. Young animals have very sensitive stomachs and feeding them the wrong thing will only make matters worse. Every species the Kevin P. Clinton Wildlife Center accepts to raise has very specific nutritional, housing and safe handling needs, so the sooner you can call or bring in the animal, the better. Baby mallards are precocial, which means they can walk and eat on their own as soon as they hatch. However, a mallard this small should not be on its own. If you see one walking around by itself, it has likely lost its way. Rehabilitators go through extensive training on how to raise and treat injured and orphaned wildlife, so getting the animal to us right away will increase its chance of survival. Remember: It is illegal to raise, possess or keep any wild animal without a rehabilitators permit. The purpose of the law is to protect wild animal populations and to protect humans and pets from disease and injury. — By Tammy O’Neil, Wildlife Care Manager at Lake Metroparks. Next article The All-New April 2019 Issue is Available Now!